Today, an increasing number of fleets are planning to go green. But, what really constitutes “green”? Some fleet managers believe that, in order to be green, the fleet must operate hybrids, pure electrics, or use a clean alternative fuel. All of these alternatives can, indeed, be environmentally friendly; however, in reality, any initiative that significantly reduces a fleet’s environmental impact can be considered green. For example, a conventional fleet that reduces fuel consumption by 35 percent through better specifications and improved utilization is, potentially, just as green as a fleet that converted to hybrids or an alternative fuel. There are many different ways to reduce a fleet’s environmental impact, and the reasons for doing so are numerous. But, if a fleet is considering adopting a green program, it’s important to first accurately define why it is considering such a big leap. Once that is determined, fleet leadership must establish a broad performance objective. This will help determine the steps fleet will take to become green and establish a means to measure the program’s success. ● Enhance the company’s public image. ● Lower overall operating costs. ● Eliminate use of conventional, hydrocarbon fuels. ● Utilize a fuel that will be readily available in the fleet’s area of operation. One of the first issues that may be encountered during the process of greening a fleet involves government mandates. The government may have requirements as to how the greening process is going to proceed. There are numerous alternatives when it comes to greening a fleet, including changing how the fleet operates, increasing vehicle efficiency, adopting electric or hybrid vehicles, using drop-in liquid alternative fuels or switching to gaseous alternative fuels, or exotics (e.g., hydrogen or dimethyl ether aka DME). Often, the alternatives can be combined. For example, a fleet can convert to an alternative fuel and make management changes to improve fleet utilization. The real question is: Which alternative should be used? To find the best solution, a fleet manager should start by defining drive and duty cycles. The fleet may also be constrained by regulations, availability, and pricing of alternative fuels; funding; and operating considerations. This last issue is very important for utility fleets that may have to respond to emergency situations (e.g., storms or floods) outside of normal operating areas. The terms “drive cycle” and “duty cycle” are often used interchangeably, but they actually measure two different aspects of vehicle utilization. A drive cycle defines how a vehicle is used, while a duty cycle defines how much it is being used. A drive cycle typically measures factors such as vehicle speed, starts and stops over a given time period, idle time (incidental and extended), and engine off time. It may also incorporate data on power export (PTO operation, etc.). This information is normally graphed showing vehicle speed over time. 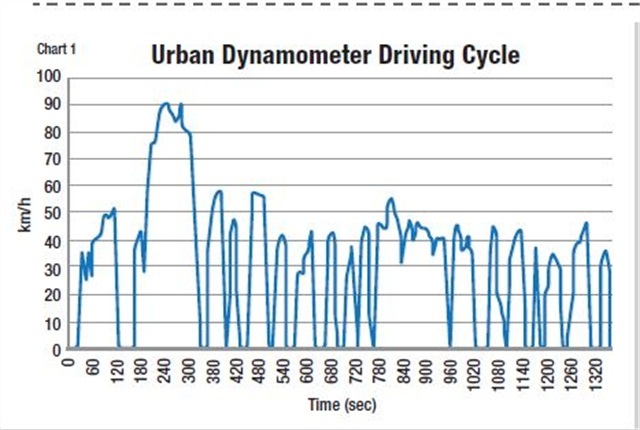 The chart above defines an urban dynamometer test drive cycle, but is typical of how a drive cycle graph will look. Duty cycles measure how much a vehicle is used. The primary factors tracked include frequency and length of use, utilization cycles per measurement period, distance driven per measurement cycle, on-road versus off-road use, load profile, and total vehicle lifecycle. There are numerous ways to track a drive cycle, such as the use of a data logger, downloading information from the CANbus, or by utilizing a telematics system. Duty cycle data typically comes from a combination of data logging and historical data, but experience shows that perceived duty cycles and actual duty cycles are not always the same, so it is important to ensure accurate usage data. Once the drive and duty cycles for a specific application have been defined, it becomes much easier to pick the right alternatives. Just remember that drive and duty cycles frequently vary by vehicle type, operating environment, specific application, and even the time of year. Other factors — such as overall objectives, mandates, financial considerations, and application constraints — may also impact the final selection. Ultimately, there is no single right answer — a fleet manager must make an educated decision for each situation. The selections must be consistent with operational requirements, such as: range requirements, availability of alternative fuels, charging cycles and usable range for electric vehicles and plug-in hybrid-electric vehicles (PHEVs), payload factors, vehicle tare weight, usable cargo space, and vehicle utilization flexibility. Websites of such organizations as the Green Truck Association (www.greentruckassociation.com) and green technology conferences, such as the annual Green Truck Summit, which is produced by the NTEA and CALSTART, can be excellent resources to help with the selection of viable green alternatives. Even if a vehicle drive cycle is a perfect match for a specific green alternative, the associated duty cycle and investment constraints may preclude its use. For example, with its drive cycle (low mileage and speeds, frequent stops, and high idle times), an inner-city truck appears to be the perfect application for a hybrid or electric vehicle. However, both options typically represent a high initial investment, so there are financial considerations. In addition, an analysis of the application’s duty cycle may show the vehicle will never drive enough miles during its life to pay back the investment. Conversely, the high idle time indicated by the drive cycle analysis may make an excellent case for the installation of a lower cost idle management system. In a related scenario, if a vehicle is utilized for two shifts a day, the use of an electric vehicle may be contradicted by the amount of dwell time needed to recharge the batteries between shifts. When evaluating alternatives, don’t overlook the benefits of making relatively simple changes to fleet vehicles. In many cases, efficiency increases of 30 percent or more are attainable through the use of technologies such as: driver behavior modification, optimized powertrains, electrification of accessory loads and power export (electric PTOs), aerodynamics, weight reduction, reduced rolling resistance, idle management, and telematics. Be careful not to overlook hidden infrastructure costs when evaluating advanced green alternatives. In almost all cases, it will be necessary to factor in costs for new shop equipment and technician training. In addition, specific alternatives have their own associated costs. Examples when dealing with gaseous fuels include, but are not limited to: modification of shops and parking facilities to meet fire codes; heating and ventilation modifications; lighting and other wiring modifications; upgrades to electrical systems for operation of a compressor station; type and size of compressor station needed; and potential for incurring demand billing for electrical service. ● Upgrades to electrical systems (charging requirements). ● Required charge level (1, 2, or 3). 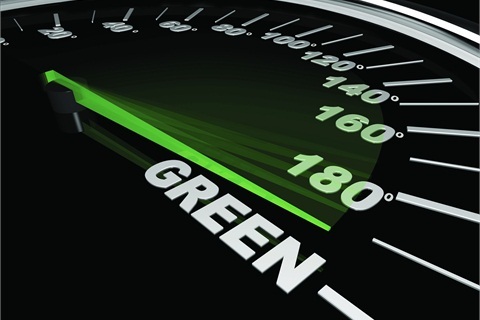 Regardless of why a fleet elects to go green, there should be some means to measure success. In the end, if original goals have been met, the fleet is financially viable, and operations have not been negatively impacted, it may be fairly safe to say the program is a success. However, don’t forget, more can always be done. Bob Johnson is director of fleet relations for the NTEA – The Association for the Work Truck Industry. To learn more about the organization and its annual Work Truck Show, visit www.ntea.com/worktruckshow. WIH Resource Group is a global leader and provider of comprehensive waste management consulting, recycling, transportation / logistical and business solutions, specializing in, among other services, waste management operational performance assessments, financial analysis. transportation / logistics, alternative fuel solutions, solid waste planning, waste and recycling market studies, business development, business valuations, due diligence and Mergers and Acquistions (M&A) transactional support and environmental services. Be sure to check out Invigorated Solutions, Inc.